Oops - we don't appear to have a video for the DR-C130. It is perfect for the job. A compact little piece of equipment for a compact office! The DR-C130 offers high speed duplex scanning of up to 30ppm/60ipm in colour and B&W. Together with a 50-sheet automatic document feeder you can batch scan documents in less time for faster and more efficient information processing. As well as easy, fast scanning, the DR-C130 delivers superior quality results thanks to a range of advanced image processing features. These include auto colour detection, text orientation recognition and skip blank page. An advanced deskew feature is also available that enables the scanner to not only detect and straighten documents that are fed at an angle but it also intelligently detects skewed text on scanned images. This helps to eliminate the need to rescan documents and ensures smooth and continuous scanning process. 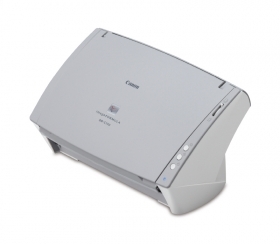 The scanner's small footprint makes it ideal for desktops and countertops where space is often limited. The DR-C130 is designed with an adaptable eject tray that can be used open, closed or half-open – it is perfect for busy working environments. The DR-C130 has been designed to encourage easy integration of information into digital workflows with an array of intelligent features. You can create scan jobs that can be registered on the ‘start' button at the front of the scanner – so with a touch of a button the DR-C130 can quickly execute the daily scan tasks you set helping you to save time. Create a digital workflow that enables you to scan directly to cloud based applications such as Evernote, Google Docs and Microsoft SharePoint. Information can be quickly scanned and shared with anyone around the world, helping you to communicate information efficiently and improve productivity. Thanks to Canon's innovative design features, the DR-C130 can process a variety of media from thick ID cards and A3 documents in folio mode and documents 3m in length. Reliable paper handling is achieved with ultrasonic double feed detection that quickly identifies misfeeds, while a convenient double feed release (DFR) function lets you ‘ignore and continue' scanning in special cases – such as when scanning with envelopes or documents with sticky notes attached.